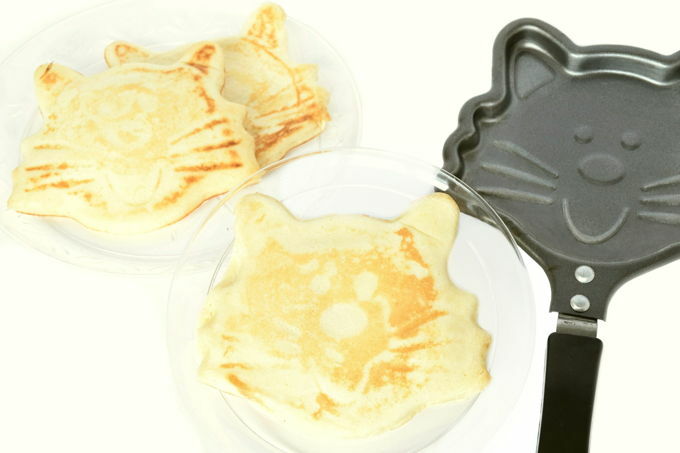 We will use both the cat skillet and a large skillet to make these pancakes. Spray non-stick spray on the cat skillet and a large skillet. Use a brush to spread it in all of the crevices of both skillets. Heat the cat-skillet to medium-low heat. For the large skillet, turn on a second burner to medium-low also. Put a tablespoon cookie scoop of the batter into the cat skillet. Tip the skillet to spread the batter in all of the crevices. Jiggle the skillet side to side to even it out. Put the cat skillet on the warmed burner. Set a timer for 40 seconds. Turn the cat skillet over – directly above the large skillet – so the pancake drops into the large skillet. Cook until it is lightly browned. Remove to a plate. For each pancake, use a paper towel to wipe out the cat skillet. Then each time, spray the cat skillet so the pancakes don’t stick to the pan. If you need to remove a pancake from the cat skillet, only use a scraper or plastic spatula. Metal utensils will scratch off the nonstick coating. When done, wash and dry the cat skillet immediately to keep it in good condition.